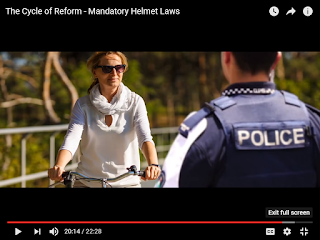 This recent film, The Cycle of Reform - Mandatory Helmet Laws, demonstrates the most harmful effects of these laws in a clear, easy-to-understand format. Australian bicycle advocates have struggled for many years to articulate the harm of their country’s all-ages helmet law as it continues to undermine bicycling initiatives. As is the case anywhere, single factual statements are shot down with emotional reactions. Simply presenting the data that bicycling has decreased dramatically since the helmet law was passed is usually met with a cry that if one life is saved it is worth it. Showing that bike helmets offer little protection in a crash with a motor vehicle is met with exclamations that any protection is better than none. Finally, through this superb film, viewers can see these issues in the context of a place that has suffered these effects for many years. We see quality of life and the saving of lives set into legitimate perspectives, including zero proof that any life has been saved because of the law. Whether a bike helmet law is at the local, regional, or national level, the population effected suffers the same degradation of their bicycle community, infrastructure, and support system. If your area is pinned down by such a law or if you know of efforts to pass such a law, please watch this film to learn how you can fight back. With this film, Australia is sure to gain momentum toward a nationwide repeal of their mandatory all-ages bicycle helmet law. My only concern is their emphasis on “low-risk” versus “high-risk” cycling. This angle was used in Spain and resulted in laws that set strange parameters for mandatory wearing of helmets based on individual officials’ opinions of risk. Let’s hope that Australian officials avoid that ridiculous route and simply repeal their law for all cyclists, leaving the choice to individuals.